The heron yesterday is a little peek under the tent insofar as work in progress. As I said before, more birds of California for the SU SF project. Got a California Quail (state bird), Brown Pelican--Blue heron in the works. Possibly a plover and maybe one more.Am concerned the critique might center around how I am knocking off Nancy Stahl--but I am not. I am working on a vector look and feel that jumps off the work done for NYC. Nancy's work is gorgeous & inspiring, but she can't be the only person to do an egret using vector work. Plus, my work may be vector, may be illustrator(flat colors)just like her, but her sensibilities and aesthetics are different than mine. I bring my own history, my experience as a graphic designer, and my me to my work. I shouldn't worry about this...and shouldn't step around doing images because someone else has "done it" before. But, I am full of insecurities around this. Hopefully, I will get over it. Would like to do a dodo bird (as Kitty and Alex are requesting it...albeit Alex wants his to have a "Horatio Hornblower" hat and a sword with his). Nancy doesnt have a dodo.Maybe go extinct and own that? No mo' Moa..etc. 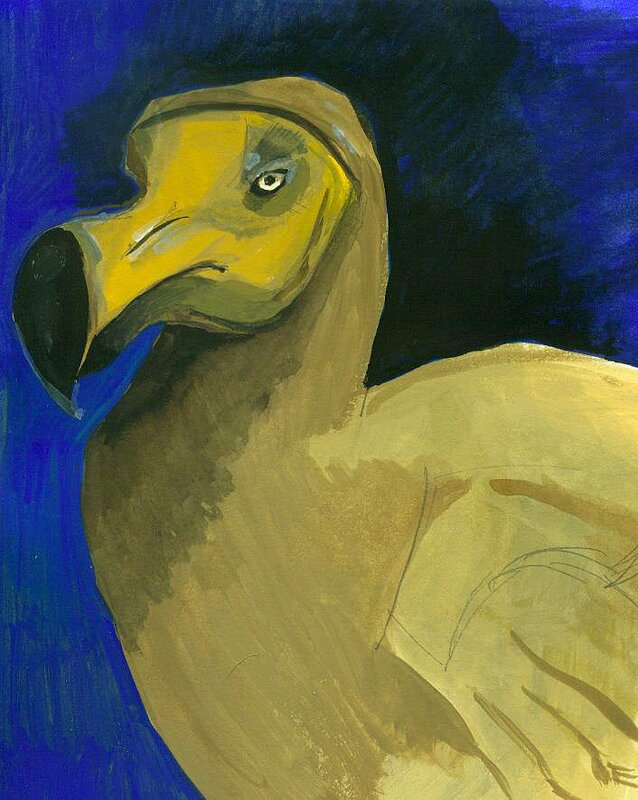 The dodo is a gouache sketch for future reference.